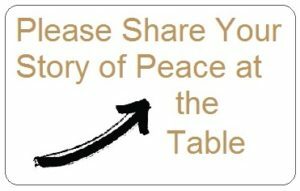 PeaceAtTheTable.World is a site about telling and sharing true stories of sitting down to eat or drink with others – and the peace that it often brings. Many of us have participated in, or witnessed a meal that has grown peace between people. share this site so we can build peace together. Food is critical to everyone and calls to us at birth in our first moments. It comes from a peaceful place before any thoughts of disagreements, hate or war. It is our most basic need that we all share. When food or drink is shared we have an opportunity to see, talk and connect with others in a most open and natural way. The need for, and the joy around food connects us all. Sharing food or drink can entice us all to return to that peaceful place with others. Meals are catalysts for peace.